Curved towel rails create a gentle, sophisticated aesthetic that's perfect for master bathrooms and luxury en suites. This 250w Fina-E electric towel rail is able to heat up to 3m² and offers simple manual control for towel warming on demand. 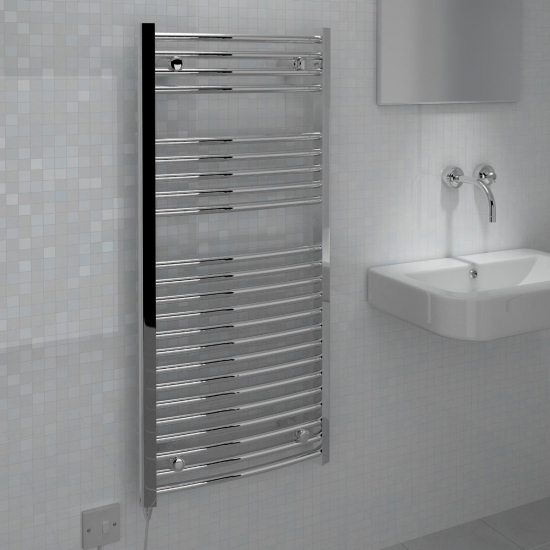 Ecostrad Fina-E towel rails come with a pre-fitted electrical element. This element may be on the left or the right-hand side of your towel rail. If you wish, you can remove the element and switch it to the other side of the towel rail. However, this is a job for a professional electrician and all manufacturer’s instructions must be followed. This sleek and stylish chrome version of the Ecostrad Fina-E provides an elegant bathroom heating solution with its curved bar design and sparkling finish. Offering a sophisticated aesthetic and 3m2 heated area, it’s a practical and attractive way of storing towels in cloakrooms and en suites.